Little Ones love sweet corn too! 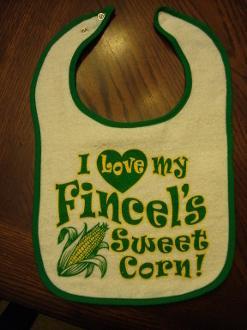 Adorn your little Fincel's Sweet Corn fan with our 100% cotton woven terry cloth baby bib, with reinforced 2 snap closure. One size fits all. If they could talk, they surely would say "I love my Fincel's Sweet Corn"!